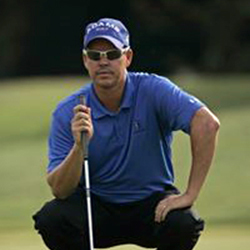 This is Brad Ott, Director of Instruction, here at TPC Craig Ranch in McKinney, Texas. Today we're going to talk about posture. What I mean by posture, posture encompasses a lot of things. Probably the more common posture components whenever someone talks about posture has to do with knee bend and hip bend. Today we're going to talk about hip bend. When you're setting up to a golf shot. Once I get a student, and this is one of the more common flaws I'll see out of my weekend golfers, in set up posture that's pretty solid, knees bent, hips bent. As soon as they start to swing one of the more common mistakes and this has to do with hip extension is the hips will extend. You'll see the hips move forward. This is called an early hip extension. What are the downsides of this? Well one of the downsides is A) your chest gets further from the golf ball. If your chest gets further, that means your arms are further. Something's going to have to happen for you to be successfully make contact with the golf ball. What most students will do at that time is they'll throw their arms at the golf ball and you'll see a very steep shaft. Once that shaft gets steep, that's almost the kiss of death. Best players in the world if you look at any tour player, their hands are very low at impact and their shaft is very shallow. It's a common characteristic you're going to see in all the best ball strikers in the world. What I'll do with my students, I'll have them do some mirroring so they'll do a little bit of mirror training. As they come into the golf ball, they'll take their hips and they'll push them back. So push your hips back as they make impact. So you keep coming from the top, push the hips back not forward but back. The more comfortable you get at pushing the hips back, the lower your hands are going to start to become and you'll start to see the shaft lay down. I think if you can lay that shaft down with your hips by maintaining that hip posture, you're going to hit the ball a lot more consistent and a lot more solid.